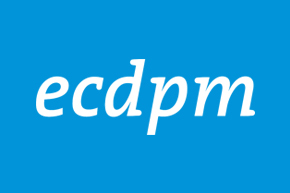 ECDPM. 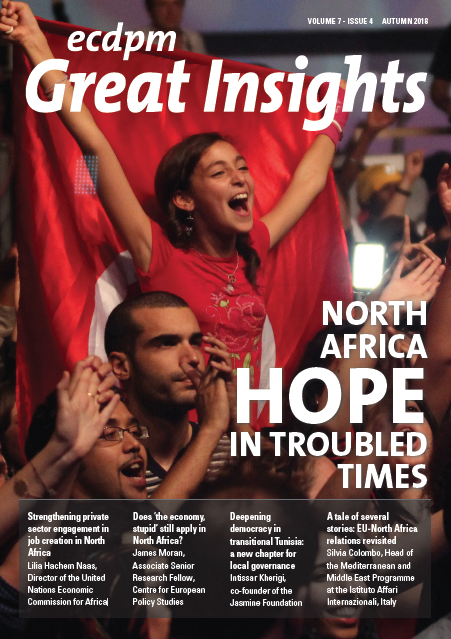 Thematic focus: North Africa, hope in troubled times. Great Insights Magazine - Volume 7, Issue 4. Autumn 2018. North Africa was the birthplace of the Arab uprisings in late 2010. This movement affected all the countries in the region, albeit to varying degrees. And while protestors asked in unison for deep political and economic changes, the various governments in North Africa responded differently to their demands. One critical question remains today: after eight years, what is left of the popular uprisings that shook North Africa? This issue of Great Insights will help us to answer this question. 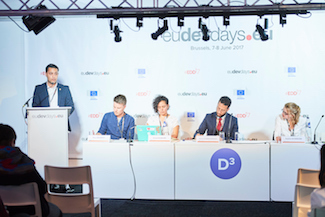 We invited a mix of authors from North Africa and Europe, with different areas of expertise, to share their reflections on a host of burning issues. The private sector has the potential to enhance economic growth and address unemployment in North Africa. To harness the driving force of the private sector, governments need to initiate bold reforms that could create a more dynamic and innovative private sector to facilitate more inclusive and sustainable growth in the long run. Civil activism in Tunisia stands as a beacon of hope in a region marred by conflict and resurgent authoritarianism. Indeed, civil society has played a critical role in Tunisia’s transition to democracy. 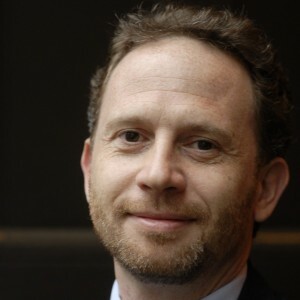 However, a controversial new NGO law sends worrying signals, threatening to undermine confidence in the country’s political transition process. Women have played a crucial role in mediation and conciliation efforts in Libya since 2011. Yet women’s contribution to mediation and conciliation remains limited due to a myriad of factors. Specific policies and adequate measures are needed to overcome these challenges. 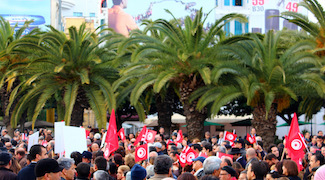 The Tunisian transitional process moved forward in May 2018 with the organisation of the country’s first democratic local elections since Ben Ali was ousted. Despite multiple challenges, this key step launches an ambitious decentralisation process and could usher in a new era of local policy-making that addresses the country’s striking regional disparities. Fatim-Zohra El Malki, DPhil Candidate, University of Oxford, U.K.
North African jihadis, returning home after fighting for the Islamic State (IS) in Syria, Libya and Iraq, are stirring debate in Maghrebi political and civil society circles. So far, North African governments have adopted a two-pronged approach to deal with the returning fighters: judicial reforms and prison rehabilitation programmes. The authorities apply the greatest vigilance in dealing with their returnees, and immediately upon their return impose harsh punitive sentences on those found to be involved with IS. The aftermath of the Arab Spring and the interventions of other players in the region have left the high ambitions of the 1995 Barcelona Declaration looking like a cathedral in the desert. Despite this, Europe continues to be the most important commercial partner of North African countries, and much potential remains. EU-North Africa relations have long suffered from excessive bilateralism and securitisation. 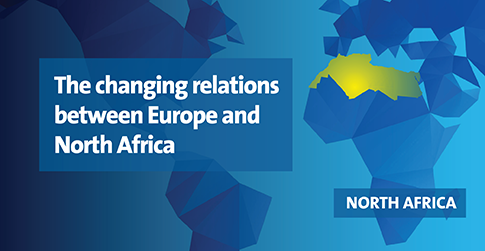 It is time to acknowledge the multidimensionality of the challenges facing North African countries and affecting Europe by fostering new forms of engagement with a stronger African component. The migration policies of Morocco and Algeria have drastically changed since the end of the twentieth century. Focusing primarily on the migration of their nationals to European countries, they have gradually become involved in ‘managing’ transit migration through their territories. 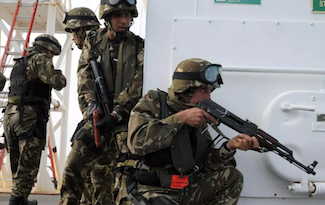 For Morocco, this first began after the Seville European Council in 2002 when the EU began to see this issue as a beacon for its relations with a number of third countries, and then since the events of the Arab Spring in 2011 that triggered the migration crisis of 2015. As regards to Algeria, the shift started when it signed an association agreement with the EU in 2005, an agreement signed by the Moroccans and the Tunisians ten years earlier. The slow pace of reform in Tunisia poses challenges to Tunisia’s international partners who are keen to support the only democracy in the region. While wholesale reforms are more difficult to implement in the current political context, targeting small, incremental changes and promoting “islands of effectiveness” could offer potential for change. The challenge is to find where to start. Egypt’s relations with sub-Saharan African countries have for long oscillated between prosperity and decline. 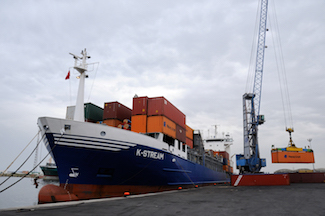 These relations have particularly developed over the past four years, driven by the Nile water issue but also the country’s mounting interest in regional integration and the search for new economic opportunities.